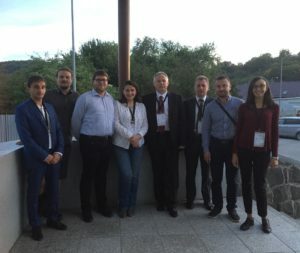 In the framework of the H2020 ACCELERATE project, CERIC took part in the 19th Conference of Czech and Slovak Physicists with a Special Session focused on the opportunities for open access offered by the Consortium. The conference was held at the Faculty of Humanities and Natural Sciences in Prešov, Slovakia, on 4-7 September 2017. The Czech and Slovak scientific communities gathered to present and share research results, find new collaborations and discuss about future developments in physics and the related fields. This year CERIC-ERIC joined the Forum with a Special Session, to raise awareness among the Czech and Slovak physicists and the communities of the neighbouring countries, about the research opportunities that it offers. The CERIC session was organized in collaboration with the Uzhhorod National University, in the framework of the H2020 project ACCELERATE. The CERIC Special Session programme included a general introduction to CERIC, with a focus on the Czech Partner Facility, and a presentation from the CERIC usersIvan Khalakhan from Charles University in Prague, Czech Republic and Adalbert Barta from Uzhhorod National University, Ukraine. Ivan Khalakhan presented the CERIC research project CEROP which focuses on the development of special samples cell to investigate fuel cells under realistic conditions. The final aim to elucidate the catalytic mechanism of cerium oxide nanoparticles as alternative to expensive platinum catalysts. Adalbert Barta presented his research that deals with the adsorption of Adenine amino acids on the surface of Titan Dioxide nanoparticles. He investigated the mechanisms of adsorption by means of instrumentation from the CERIC Czech Partner Facility in combination with theoretical calculations. The CERIC Special Session was also a great opportunity to discuss potential collaboration activities between CERIC and the University of Prešov, with the aim of contributing to the development of Slovak scientific research through the single-entry access point to excellent research facilities that CERIC is offering both to scientists and commercial users.